Until about 75 years ago, barn raising was a common custom in the rural United States. People came together from all parts of the community to help construct one family's barn. Although the custom has largely disappeared in rural communities, we can still benefit from the barn raising approach in problem-solving organizations. Things turned quiet, because the three of them were stumped. Jane absently swirled what was left of her coffee in her mug. To break the silence, Judith asked, "So you've got the space, but not the money to move the library into that space? Do I have that right, Dave?" "Right," he replied. "It's idiotic." 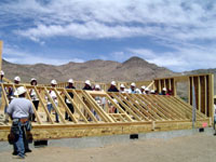 A team raises a wall of a new home in Nevada sponsored by the US Department of Housing and Urban Development, in an echo of an old-fashioned barn raising. Photo courtesy U.S. Department of Housing and Urban Development. Jane stopped swirling her coffee and looked up. "What about a barn raising?" Dave and Judith stared. They'd heard of barn raisings, but they couldn't make the connection between barns and library moves in high tech companies. Jane saw their confusion, so she explained. "We can afford cardboard boxes — we just can't afford movers. So we get some boxes, tag them with shelf numbers, tag the shelves, and then get everybody in the building to pack the books, dolly the boxes to the new space, and then unpack them onto the tagged shelves in the new space." Dave got it. "Brilliant. But where does the barn come in?" Dave was smart — up to a point. Judith explained. "There's no barn, Dave. It's not a real barn raising, but it's like a barn raising, everybody pitching in." And for this task, it just might work. What kinds of tasks can we tackle with a barn-raising approach? Any task that you do rarely or one time only is a candidate. Culling file cabinets twice a year, or organizing shared laboratory space are good examples. If only a small segment of the organization benefits, a barn raising isn't likely to be viewed as a community project, especially if it's a one-of-a-kind project. But improving a shared facility could work well. For instance, reorganizing or moving a library could be a successful community effort. Choose projects that permit the work to be spread over enough people to get it done in one day. The reward of successful completion, with a celebration party, is essential to building a sense of community achievement. Even though we have many possible virtual projects in the modern workplace that might be handled with a barn raising approach, real projects are better candidates. They cause people to work side-by-side, where they have opportunities to talk, to meet each other in unfamiliar circumstances, and to form and renew relationships. Want to learn more about organizing workplace barn raisings? See "Organizing a Barn Raising," Point Lookout for August 9, 2006. Would you like to see your comments posted here? rbrenBaFHzjPXCbStYuDUner@ChacLLoYxJUMIivVAuFyoCanyon.comSend me your comments by email, or by Web form. Up and down the org chart, you can find bits of business wisdom about motivating people. We generally believe these theories without question. How many of them are true? How many are myths? What are some of these myths and why do they persist? I offer email and telephone coaching at both corporate and individual rates. Contact Rick for details at rbrenkcGXQGkEInqLAGuNner@ChacAnjSKOPOvfLJspeIoCanyon.com or (650) 787-6475, or toll-free in the continental US at (866) 378-5470.